It’s 16 years since Elizabeth Gilbert’s first work of fiction, a collection of short stories entitled Pilgrims was published, and 13 years since her first novel, Stern Men. A long time between drinks, except that in the intervening time there has, of course, been the massive success of her memoir Eat, Pray, Love – the book that spawned the movie and caused Oprah Winfrey to nickname her a ”rock star author”. Despite her image as an overnight success, therefore, that success has been almost two decades in the making, and the long break away from fiction has done this writer no harm. This is the third Gilbert book I’ve reviewed and despite the fact that this is fiction, it is interesting to ponder the similarities in the writing, or in the inspiration for the writing. Gilbert is a master at taking an individual life and extrapolating out into a wider universe, whether it’s her life, or someone else’s. The lives that most concern her in this massive book, reminiscent of a Victorian novel in its breadth and depth, are those of Henry Whittaker and his daughter, Alma. As the poor but enterprising son of a gardener at Kew Gardens, young Henry is caught stealing botanical treasures from the great Joseph Banks. Banks, out of respect for Henry’s father and because he realises the extent of the boy’s knowledge, offers the boy a chance to avoid punishment by going to sea to search for specimens. So Henry finds himself aboard Captain Cook’s Resolution, among other boats – witnessing Cook’s violent death in Kealakekua Bay, Hawaii. When Henry finally returns to England to claim what he thinks will be his rightful place in society after his worldwide work on Banks’ behalf, Banks snubs him, and the humiliated young man vows to become even more successful than Banks. He marries an upright hard-working Dutch woman, Beatrix, and together they sever all family ties, moving to Philadelphia in the US. Here, Henry sets about building a herbal, botanical and pharmaceutical empire, becoming one of the richest men in America. The Whittakers have one daughter, Alma – not a beautiful girl, as Gilbert writes her, overly large and stocky and with a shock of red hair, and nicknamed ”Plum” by her fond but undiplomatic father. In a strange twist of fate, they also adopt a daughter, Prudence, a beautiful, apparently ice-cold maiden set up as a foil for Alma’s overflowing personality. In many ways, while The Signature of All Things charts a massive chunk of the world of the late 18th and early 19th century, it is really about relationships, and in particular Alma’s relationships to her family, her few friends, her botany (at which she excels), the elusively androgynous Ambrose Pike, and most importantly, to herself. Take out Alma’s frequent visits to the book-binding closet to, as they used to say, pleasure herself, remove the essential, sexual mystery behind Pike, and his mysterious death in Tahiti, where he has been banished by the heartbroken Alma, and you would have a story that might easily have been penned by George Eliot or Anthony Trollope. The extra layers of sexual desire, masturbation and madness, on top of the already mighty themes of botany, slavery, education for women, religion and the presaging of the industrial revolution, create for the reader a complex, humorous, multi-faceted jewel of a book, to be savoured – all of its 500 pages – over many days. But, you might ask, what exactly is the signature of all things? To describe it would be to give away the kernel of the book, the alchemical process by which Alma gradually comes to know herself and the world. In part, that knowledge comes from her devotion to her beloved mosses – an area of botany she has discovered is sadly neglected until she strides upon the scene, determined to categorise and make sense of this both massive and miniature world of green. The research into the botanical world of that era is astounding. Gilbert’s ability to create characters so real it’s hard to believe they are fictional is a feat that proves that whether her eye for minute detail is turned on herself, on a subject such as Eustace Conway in The Last American Man, or on a world of her own creation, the sheer sweeping ease with which she writes does indeed make her a writing rock star. So there we are, sitting in the middle of the ocean, and not a breath of wind in sight. We’ve come up to the beautiful Whitsundays for a week’s sailing, and even I, as a non-sailor, know that wind is kind of essential to make the boat move. Not only that but due to the other half having never experienced the Whitsundays without wind, he hasn’t bought quite enough petrol with him, so we’re not sure if we’ve got enough to get back to Whitsunday Island where we’re camping for four nights. It’s all a little bit hairy, if you get my drift, which is certainly what we were doing – drifting. Not only that, but something’s gone wrong with the motor and it’s not working. Surely there must be wind somewhere, we beseech the sky, which taunts us with some tiny little gusts from every direction at once. Finally, the motor decides to splutter into life, and having had to give up on our attempt to get to a snorkelling spot, we opt for lunch in one of the many beautiful coves that dot the edges of these tropical paradise islands. We drop anchor in May Bay among the million-dollar motor-boats and try to look as if at least, because we’ve got sails, we’re superior. Which would be all well and good if the sails were actually working of course. We dive into the deep, clear blue water, and consume a delicious picnic lunch on deck. It’s enough to restore our optimism entirely, and even better, the wind picks up, so I’m told we’re going to sail out of there triumphantly. Unfortunately the only large gust of wind of the day arrives at the very moment we discover the anchor is stuck deep down below – probably snagged on some coral – and we’re heading at high speed for one of those above expensive motor boats, and I have NO idea what I’m doing. Disaster is averted by a millimetre, the anchor finally obliges, and we sail for all of 500 metres before the wind disappears. Apparently, this is what sailing is all about – hours of boredom, minutes of adrenalin and moments of panic and pandemonium. We motor slowly back to our temporary home on Dugong beach, with our sails between our legs, and wonder exactly how we’ll manage to do the snorkelling trip we’ve planned to Blue Pearl Bay the next day, and get our selves back all the way to Shute Harbour in Airlie Beach the day after if we have no wind and not enough fuel. But in a way, all of these adventures are part of what we wanted – a down-to-earth (or sea) real-life as far away from the madding crowds style holiday as possible. Dugong Beach on Whitsunday Island has only eight camping spots, metres from the edge of the beach, fringed with shade, and walks to Sawmill Beach, or if you’re feeling fit, to the top of Whitsunday Peak. It’s picturesque and peaceful. Shortly after we arrived we were the only two people on the island, with only the resident Curlews and goannas for company. We took our chairs down to the sand and watched the lazy resident turtle bob across the bay, and felt we were very privileged indeed. Now, though, we’re lucky in a different way – experiencing the kind of friendly helping hand that I’ve found is often extended on holidays, and I hope I’ve offered in the past myself. 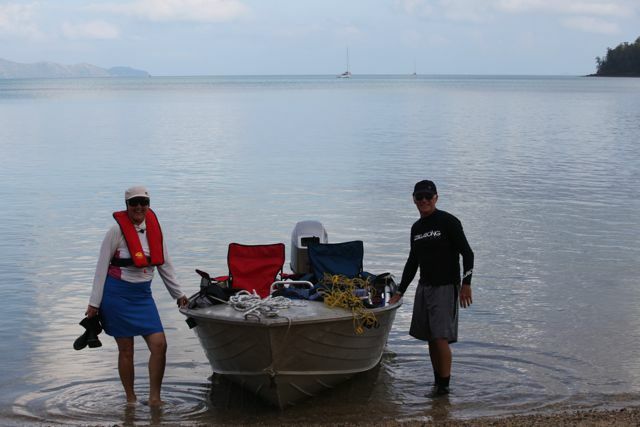 We meet a couple, Liz and Paul McCarthur, who both work on Hamilton Island, and are taking a few days out camping on Dugong. They offer to take us snorkelling in their motor-powered runabout, and we accept their offer gratefully. If yachts need wind, motorboats most certainly don’t and skimming across the flat ocean the next morning is a treat in itself before we even arrive at the aptly-named Blue Pearl Bay. On the way, we pass Hook Island and Hayman Island, and when we arrive at the Bay one of the lovely things about it is that there is every kind of boat there – from massive old clippers redone as charter boats, private yachts and motorboats and smaller charter boats. There’s even a custom-designed drop-people-straight-on-the-beach from Hayman Island boat, a long thin flat-bottomed affair with three genteel steps forrard (that’s a nautical term just so you know I was paying attention) so people can simply walk down onto the coral beach, and straight into the water. And what water it is. This is not my first snorkelling experience on the reef, but it certainly was the best so far. As soon as we slid into the water, we were surrounded by fishes of all shapes, sizes and colours – angel fish, butterfly fish, the exquisitely coloured parrot fish, to name but a few, and the highlight of this particular bay, the incredibly friendly, curious and massive Murray Wrasse, with his or her smaller friend, who followed snorkelers about in an almost dog-like fashion. 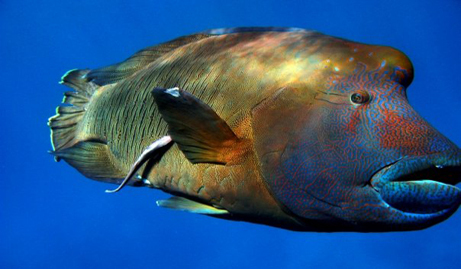 Murray Wrasse can live to the ripe old age of 30, and can grow up to two metres long, but are unfortunately still on the endangered list because of their reputation as a fine fish to eat. One of the most extraordinary things about snorkelling is not only the invisible presence of this brightly coloured underwater world below the surface of the sea, but the blissful silence. I drifted through the water, schools of fish twisting and turning around me, and felt completely at peace. Back at Dugong we watch the sun turn the sea a golden orange; in the morning we wake to the turquoise still waters of our little beach. I manage to cook some strangely imaginative meals over our one gas burner, we marvel at our nocturnal visitor – the cheeky bush rat, the shy potoroo and the tiny marsupial mouse are all visitors to our campsite, while no night would be complete without the mournful wailing of the Curlews. Every morning I wake up to the sight of the beautiful hoop pines that cover this and all the 74 islands that make the Whitsunday group, and thank god they have not been completely deforested. As the days go by, we become increasingly grateful that we have a tiny luxury in the form of the shower tent for our solar powered shower bought just before we left. I’d had the foresight to make a bargain – five days sailing and island living in return for two nights luxury. Clever me. By the time we sail (with a little helpful motor power of course since there is still hardly any wind) into Shute Harbour I’m more than ready for a little luxury. I’ve chosen Peppers in Airlie Beach as our destination, and the resort is perfect. A large one-bedroom apartment with a huge deck overlooking the new Port Harbour complex, and with a huge spa bath, is exactly what is needed for restoration. The restaurant serves delicious tropical meals, and it is right next to the wet-edge pool – easy to go from eating to swimming and back to sleeping. It’s also a perfect antidote to the 75 (I counted) sandfly bites I unfortunately collected. Warning: take the strongest mosquito repellent that exists and wear it permanently. Ahhh, tropical island holidays! Airlie Beach is a perfect holiday town. The European-style restaurants and cafes along the tree-lined boulevard next to the park are beach are full, the child-safe lagoon offers relief for families and children on holidays, and there’s plenty of shopping in the main street. What the Whitsundays offer is the best of all worlds – a holiday everybody can enjoy on any budget. For me the mix of adventure and luxury was perfect. To get to Airlie Beach fly Virgin or Jetstar to Proserpine. 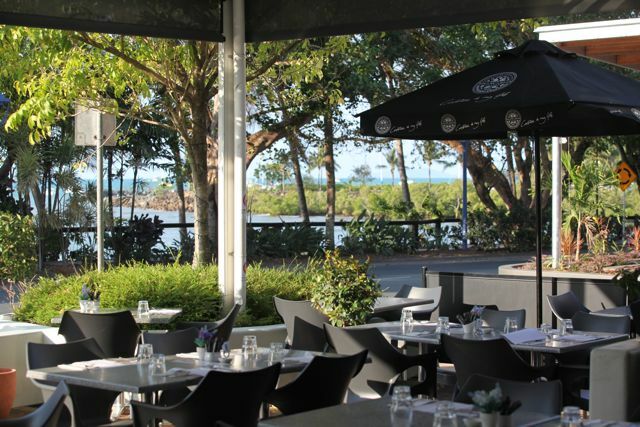 There are regular shuttle buses to Airlie, which is about 40 minutes away, or hire a car from Proserpine. 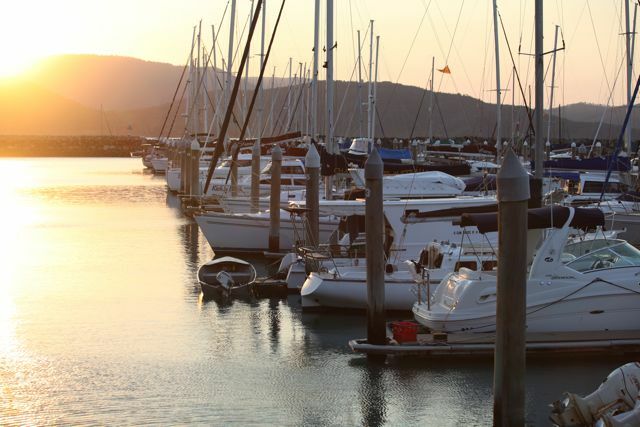 At Airlie, Shute Harbour has plenty of charter boats on offer. For most of the boats no boat licence is required, and some companies, such as Bare Boat Charters, offer shorter charters of three, four or five nights, see airliebeach.com/bareboatcharters/welcome.html. 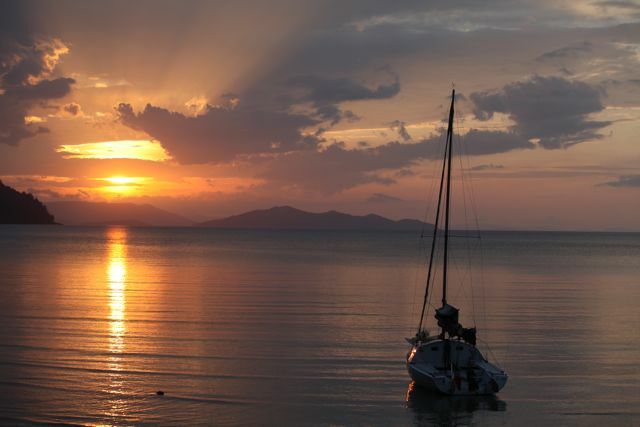 You can hire anything from a small yacht to a sailing or powered catamaran, a motor-boat, a luxury crewed power cruiser, or a crewed sailing ship. According to charteryachtsaustralia.com.au/, the cheapest charter is around $440 a night for a yacht that will carry a maximum of four up to around $1800 a night for a sailing catamaran which takes up to 10 people; the sky’s the limit on the luxury crewed boats. Charter companies offer boat tuition and help is just a radio call away. Many of the Whitsunday Islands offer camping. See nprsr.qld.gov.au/parks/.